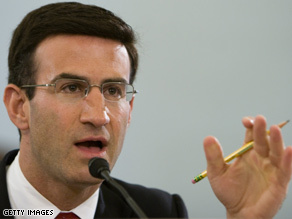 Orszag is expected to join Obama’s team tomorrow. (CNN) - Two sources close to the transition tell CNN that on Tuesday, President-elect Barack Obama will officially unveil Peter Orszag as his nominee for director of the Office of Management and Budget at a press conference in Chicago. Obama hinted at this at an event Monday, when he suggested his Tuesday event would focus on finding cuts in the federal budget to help dig the nation out of the fiscal crisis. “Full recovery will not happen immediately,” Obama told reporters. “And to make the investments we need, we’ll have to scour our federal budget, line by line, and make meaningful cuts and sacrifices as well, something I will be discussing further tomorrow." Thank you, Senor Bill Richardson, for waiting a little bit longer for SOS. We love you and I believe you will be president some day. Bill Richardson ROCKS!!! Finally... our nation will have competent cabinet members instead of cronies and campaign contributors. Maybe something will finally be done correctly... and we won't have to worry about the Bush Administration screwing up any more crisis events. Imagine FEMA just like the old days before Bush moved it under the Dept. of Homeland Security and then gutted it... actually helping people involved in disasters in a timely and effective manner again after Obama's people fix what Bush did to it. Keep dumb people out of the White House!!! No more Bush... no more Palin!! Glad to have you aboard Bill. Mr. Change is now Mr. Doom and Gloom, trying to lower everyones expectations so that nobody will expect him to accomplish anything during his tenure. Brilliant. Only problem is the fact he was hired to solve our problems not talk about how bad they are. America truly loses. We have to tell him to tell the capitalist that are left that they won't be punished with his policies of high taxes, strong unions and excessive spending. If not, yes, we will lose millions of jobs and lose then over the next four years.